Â Sometimes every student needs help with his or her essay writing. 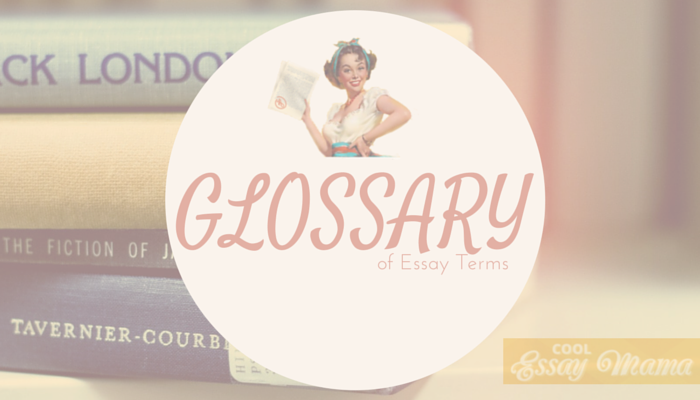 As an essay writing helper EssayMama's team has decided to create this 'Glossary of Essay Writing Terms for Students' to give you some tools for better writing. This glossary is constantly checking and updating by our team of writers and editors. If you have any suggestions or questions - feel free Â to contact us via comments below. Also don't forget to download our Essay Writing Guide. AMA style - A Guide for Authors as of the style guide of the American Medical Association. The guide is written by JAMA (Journal of the American Medical Association), plus the Archives journals. Abstract nouns - A noun that doesnâ€™t describe an object. It may describe an idea, state or quality. Academic writing - A form of writing that makes a point or answers a question using reliable and academically credible sources to ensure the written piece is accurate and correct. Admission essay - An essay written by a person wishing to enter an academic institution, usually with the aim of becoming a student. It is written to help demonstrate the academic prowess of the applicant. Analogy - a comparison between things that are similar so as to help the reader understand something more clearly. Analysis - The study of facts, figures and evidence to narrow down its relevance to the subject in hand. Analysis is done to find meaning in what could otherwise be viewed as standalone facts, figures or evidence. Anecdote - An account of something that is defined as hear-say but may be relevant in explaining a point or getting people to understand more clearly. Annotated bibliography - A bibliography that is full of citations and references, but each entry is followed by a short chunk of text. The text may describe the references/citation, or may help the reader understand the reference or citation. APA style - This is a writing style and referencing style that is used by the American Psychological association. Argumentative essay - An essay that shows more than one side of an issue. Two or more sides/arguments are placed within an essay so that comparisons, contrasts and conclusions may be drawn. ASA style - This is the style used by the American Sociological Association when preparing works for journals and publications. Assignment - A set of instructions that are put together to help a person undertaking a task to draw it to a conclusion. They help a person reach a designated goal as set out by the assignment itself. Audience - The people, group, or entity that receives information from another person, group or entity. The information is directed at an audience with the aim of having the audience take the information in. Bias - The taking or adopting of one side of an issue, argument or idea to the detriment of the other side(s) of the said argument. It may also mean focusing on one element, issue or argument with relatively exclusivity. Bibliography - A list of the citations and references used within the work. They are usually indicated within the text with fuller descriptions present within the bibliography. It is to help the reader follow up on a point or data that is present in the work. Bluebook style - This is a uniform system of citation set out as a style guide. It is used mostly by people in the legal industry within the United States. Body - The essay body is the bulk of an essay that is usually structured as per the decision of the writer. In itself it may contain things such as evidence sections, evaluation sections and analysis sections, as well as numerous other relevant sections. Brainstorming - The act of focusing on a single idea or problem without a structure and allowing ideas to free flow as a result. One idea may lead to another or may exist on its own alongside other thoughts and ideas. Calculate - To compute one section of information in order to draw results or alter the original information in some way. It is seen quite a lot within mathematics and programming where information is computed to draw a retraceable result. Case Study - A record and processed data that is part of research, or used as research, into the development of a group, situation, thing or person over a set period of time. It may also be something analyzed or used to illustrate a principle, point or thesis. Cause and effect essay - An essay that is structured in a way that joins events, thoughts and/or actions and links them in some way. One element is called the cause and the other the effect, with the effect being the result of the cause. CBEP - This is a Community-Based Education Project or Program. Characterization - The addition of motivation to a character or entity of some sort. This may include things such as character history, emotions, situations and personality being mixed to form a fuller character as a whole. Chicago/Turabian style - This is the style guide used for American English. Chronological order - Items or points are ordered according to their timeline. It may be events put in the order they happened, or set against a sequence that is usually based on a linear timeline. Citation - The act of referencing the work of another directly. It means copying or paraphrasing the work of another and using it as evidence. A citation is not credited to the person doing the citing (i.e. it is not the writer idea that is being quoted unless self quoting earlier works). Cite - To draw attention to the creation of another. It is usually done to prove a point. The person doing the citing does not claim ownership of the work that is cited. Clarify - To better explain a certain point. This is sometimes done with examples or the production of further evidence however, it may also include stories and analogies that draw a similar comparison. Classification essay - An essay that opens up a subject and explores it more thoroughly. The idea is to help the reader more fully understand the subject at hand. ClichÃ© - A term or action that is nestled deep within the public zeitgeist to the point where it is considered overused by those that have had experience with it. Cluster Analysis - Cluster analysis or clustering is where similar objects are grouped together to be analyzed. This may be an efficient way of analyzing a large amount of data, but may also cause inaccuracy if incorrectly done. Cognitive skills - These refer to the skills a person has as per their intellect. They include skills such as computation, analysis, evaluation, spotting differences, comparing, contrasting, biased and unbiased thinking. Even creatures without lateral thinking may still have cognitive skills, albeit far inferior to human cognitive skills. Coherence - The act or state of being logically consistent. In academic terms it means to be clear and easy to understand by the intended audience. Colloquial expressions - These are expressions used by a relatively large amount of people, but that are localized in one area. This may be as small as within a company, as large as within a country or community. Comparison essay - Where elements or points are compared within one essay. Items are highlighted for one element or point and then compared to another or numerous other elements or points. Composition - An arrangement. Arranging something in order to make something else or something new. This may include taking smaller parts to make a larger part. Conclusion - This is where a hypothesis, usually located in an essay introduction, is concluded upon first by reminding the reader what the hypothesis was. It may draw upon elements within the rest of the essay to prove a point. Connotation and Denotation - Connotation refers to the emotional, imaginative and ungraspable parts of something. Denotation refers to the literal significance or primary significance. Content and Form - These are distinct aspects of a piece of work. The content is the primary makeup of the piece of work, which usually refers to the text and media side of things in academics. The form refers to the techniques and style used, and may refer to the media being used, though not the media that is inserted. Context - This refers to the surrounding conditions, which may include the circumstances, environment or events. Words are given context based on the words surrounding them, the nature and tone of the work as a whole, and the emphasis inserted by the writer. Continuity - An unchanging quality that may also be described as a constant. It is a consistency or a consistent whole, and may describe how one element connects to another to make them smaller parts of a larger whole. Contrast - A marked difference between two or more things. Juxtaposition of different things. Copyright - This is the legal right a creator is given in a free society. It gives the creator control over the work produced for a certain number of years. Coursework - This is work issued by an academic institution that upon completion will count towards a final grade and/or a pass or fail. Not completing coursework may negatively affect a studentâ€™s final grade, score or pass. Cover Letter - This is a note issued by the sender to briefly explain the other items that are being sent. It may also explain the motivations for sending the other items and the desired result of such. Credibility - This usually refers to believability, but in academic terms means a point that may be proven. A reliable resource is usually required in these cases. Critical essay - Presenting an objective analysis that has either a neutral, positive or negative outcome, and sometimes offers praise and advice on improvements. Criticism - To make a remark, comment or point that draws attention to an issue. Usually the issue is something of fault that the criticizer wishes to highlight. Constructive criticism will help the original creator to improve whatever he or she has created. Current literature - Literature that has not yet been discredited or proven incorrect. Data - Information that may take many forms. It may be used as a discussion point, as evidence, as part of a calculation or as research to another end. Dead copy - Often referred to as the original piece of work that the live copy is compared to. Deadline - This is the time limit given for a certain task. A deadline can be as long as the issuer decides, be it a few minutes or a few years. Deduction - A conclusion drawn that often relies on logic or the weighing and concluding upon evidence. Deductive essay - The evaluation and concluding upon an issue. It may also include analysis. Definition essay - An essay that defines something by exploring its many meanings and its effects. It helps the reader to understand or better understand something through reading the essay. Denotation - The most basic or literal meaning. A specific meaning or primary meaning or description. Description - Giving an account of something. The aim is to help the reader understand something or identify what something is. Development - The process of moving from one state to another, usually done through some form of work or process. It may be an event that causes change or used to describe the process of change. Dialectic essay - The act of making an argument and then objecting to it, only to defend the original argument and conclude. It is form of argumentative essay with a simpler and more streamline framework. Diction - This is the spoken clarity or choice of words. It may be used to describe a type of work/paper/artistic piece. Dissertation - A very long essay that usually goes above and beyond 12,000 words where an issue is fleshed out in the best and most comprehensive way possible. Distinguish - The act of recognizing and noting differences, or to recognize differences as a process. Division - Splitting, sharing or disagreeing. To separate or divide. It may also be a section of an organization. Documented essay - This could define most essays. It is an essay that uses research to support a principle, point, idea, hypothesis or idea. Dominant impression - In academic terms this may be considered the controlling idea to which the writer must remain consistent. It may also represent the hypothesis or thesis if it were to control the quality, atmosphere, mood or tone of the written piece. Effect - A change that comes as a direct result of something else, which is usually a cause. It may also denote the power to influence. It may mean the impression given. It is used as a noun, whereas affect is used as a verb. An affect acts upon, and the effect is the result. Elaborate - To better explain something in more detail so that the reader may understand it more fully. It may also mean explaining something to remove any vagaries or potential misunderstandings. Emphasis - To draw attention to something and expose it. To add emphasis may mean to expose something more fully when compared with other elements within a written piece. Enumerate - To list thing individually or count them. To give numbers to something, usually to order or count them. Essay - A standard piece of academic writing that draws upon academically credible resources or academic knowledge to make a point, expose something or to pose a question. Essay hook - This is the element of an essay that draws the reader in. The aim is to help the reader decide if he or she should read the essay by trying to capture the readerâ€™s interest. Etymology - The study of words or their origin/history. They commonly explain why we use words the way we do. Evaluate - To take all the evidence and all the points made and assess their validity with an aim to drawing a conclusion. The assessment of validity may include drawing upon the original hypothesis to see if the evidence, facts and points made are actually relevant and/or meaningful. Evidence - This is the available body of information and facts that indicate whether a proposition or belief is true or valid. Examine - To explore something in detail that usually involves taking notes. It is done to help improve knowledge about a subject or idea. Expand - Usually this means to make larger, but in academic terms means to better explain or elaborate. To make something more detailed, in-depth or less brief. Exploratory essay - Exploring a problem or an issue without trying to support a thesis. It may be as simple as a piece of research that opens up a subject so that it may be studied more closely or in more detail. Expository essay - A type of essay where the writer investigates an idea, expounds on the idea, evaluates evidence, and sets an argument concerning the idea in a concise and clear manner. Figurative language - None-literal language or representational language. It may refer to representing by allegorical figures. It may mean using an emblematic human or animal figure to represent an abstract question quality or idea. Flashback - An earlier event or scene. In written work it refers to the reference to an earlier event or scene. Footnotes - Additional details found at the foot of the essay or at the foot of the page. It may not be necessary for reader comprehension, but is there if the reader wants more detail. Formal essay - An essay using an academic structure, type and style, and absent of creative diversions or poetic license. Framework - This is a structure through which something works, is written, or is held up. Standard frameworks within essays make reading and studying different essays easier because they are structured in a similar way. Free association - Using a word(s) or image(s) to spontaneously suggest another without a logical connection. Full references - Short references may give an idea of the source material, but full references give an easier-to-follow-up insert for each reference. The act of giving full references may also include adding references to all facts, principles, points and ideas that require proof or that are not the original creation of the writer. Galley - A trial print run or trial publishing run. Generalization - A sweeping statement that is almost impossible to fully backup because of the randomness of the universe. Give an account of - To describe, usually in detail. GPO style - The style used by the United States Government Publishing Office. Harvard style - Parenthetical referencing that is one of the most commonly used referencing styles in the USA. Many colleges/Universities have variations of their preferred Harvard style. Heading - A subtitle or subtitles used to break up text into easier to understand and/or read sections of related material. Hyperbole - To exaggerate, usually to make a point with more impact. It is deliberate and obvious exaggeration to make a point in a way that does not come across as an outright lie. Hypothesis - A theory, question or point that needs investigation, disproving or proving. It may also be an assumption that is taken as true for the moment. Idiom - A fixed expression with a non-literal meaning. It is difficult, if not impossible, to deduce the meaning alone or out of context. In-text reference - The act of putting a reference within the text so that the reader knows where the preceding point or evidence came from. Induction - Inducting somebody into an institution, business, organization or position. Or, the process of creating/inducing an idea, feeling or state. Or, a logical conclusion based on evidence. It may also mean the scientific method, generalizations based on observation, or the making of generalizations. Inference - A conclusion or reasoning process. An implication, deduction, supposition or the act of conjecture, assumption and/or presumption. Informal essay - An essay that breaks the more formal academic rules when it comes to essay writing, usually for a creative reason, to make a more human-based or emotional point, or to make the text more interesting to read for the target audience. Introduction - The text found at a start of an essay that helps the reader understand what the essay is about in general terms and if the reader will be interested in the essay content. Irony - A form of humor that suggests the opposite of a literal meaning. Humor based on incongruity or based on contradiction. ISBN - In publishing it is the International Standard Book Number and is used to catalog publications in a similar way that barcodes catalog groceries. It is a library specifically for publications. Jargon - Specialist language used by groups, companies or a culture that means something to both those within the group/company/culture and others. Lab Report - The details of work done in a lab that may be used later as evidence or for the basis of analysis. Levels of thought - What is focused upon in academics and to what degree it should be focused on. Linking word - They help create longer sentences whilst maintaining fluency. They may show a relationship between points or ideas. Literature essay - An essay written to inform the reader or to deliver a message to the essay reader. Literature research - The use of credible and respected resource during the research process. Loaded words - High inference language that helps direct a thought or conclusion in the mind of a reader. It may evoke a stereotype or emotion with its use where another just as suitable word wouldnâ€™t. Logical fallacy - An error in reasoning especially related to correct and incorrect logic. m-dash - Used to show that a word continues on to the next line. It may also be used to create a strong break in the structure of a sentence. Margin - The space between one element and another. Most commonly used in essays to specify where the page edge should sit and where the text should begin. Marker - An indicator usually used to indicate a position or presence. Meta-Analysis - The use of a statistical approach that combines results from multiple studies to increase the resultâ€˜s power over individual studies or improve estimates. Metaphor - It is an implicit comparison or the use of figurative language. It is an implicit comparison to describe somebody or something. It may be a vivid comparison that is not meant literally. Figurative language involves symbolism or figures of speech that are not literally supposed to represent real things. Methodology - An organizing system or the study of organizing principles or rules. MLA style - This is the style used by the Modern Language Association. People use them for the preparation of research and scholarly manuscripts. MS - This may represent the company Microsoft, or Master Of Science degree. It may also mean Middle School, Medical Student, Mass Storage or Management System. n-dash - A wider version of the em-dash or m-dash. It is used to connect words such as the use of the dash between N and dash within n-dash. Narrative essay - This is an essay that has a clear narrative. It is usually written in the first person to this end. Non sequitur - Purely defined it means that something doesnâ€™t follow the set pattern, but usually refers to an incongruous statement or an unwarranted conclusion that secure doesnâ€™t follow from its premise(s). Norm - A standard pattern of behavior that is usually set within a culture or a group. It may also describe usual behavior. Objective writing - Writing that can be verified through facts and evidence and is less biased than subjective writing. Organization - The coordination of components into a single structure or unit. Outline - A plan for an essay or a summary used as a guide for an essay. Overview - A summary of the main points of a piece of work, or a broad survey. Pacing - In terms of written work, it is the rate at which the reader is taken from one element/point/section/idea to another. Paper - In academic terms it usually refers to an essay or a piece of academic work. Paradox - Something that seems right but is actually wrong, or something that seems wrong but is actually right. It may be absurd or a contradiction that either proves itself to be correct, or is seemingly correct. Paragraph - A way of breaking up a piece of work into readable chunks whilst maintaining a similar theme, idea or point. Parallelism - A parallel state or the deliberate repetition of sentence structures or words for a desired effect. Paraphrase - To rephrase something in a way that keeps its meaning, but also adapts it to fit the work it is being inserted into. It often takes heavily from the original source, which means it should be noted as a quotation rather than a general reference. Parody - A copy or inferior copy of something. It may be copied in a comical or satirical way. Peer Review - An evaluation by experts, usually experts within relevant fields. Personal essay - An essay that may be conversational in nature, or may feature elements of the writerâ€™s life or opinions. It may be autobiographical non-fiction, creative non-fiction, or works of a personal nature where all facts are not verifiable. Personification - The embodiment of something or the representation of an abstract quality being human. Persuasive essay - An essay that works to either reaffirm the readerâ€™s belief/ideas, or to change the readers thinking from one way to another. Plagiarism - The copying or rewriting of the work of another person. Even a cleverly rewritten piece of work is still plagiarized, it is just harder to detect than written content that is copied verbatim. Post hoc, ergo propter hoc - This is a logical error. It may involve stating that an effect created a cause, which is usually incorrect outside of the physics and/or mathematics field. Prewriting - Preparatory work done before writing. Academics often write notes and a plan prior to writing an academic piece of work. Process analysis - Writing that gives instructions on how something is done. It is an organizational form of writing that exposes processes and is often seen within self-help papers/books. Process words - These are words that give instructions on how to do something within an academic context. They are words that mean something specific within academic terms that instruct a writer upon what needs to be done. Proposal - A suggested plan or idea that is put forward officially or unofficially. Prove - It means to establish truth, which may be done in a number of ways, but usually involves some sort of evidence. Questionnaire - A series of questions directed at one person. They are usually used as fact-gathering tools. They will feature either open-ended or closed questions. Quotation - Text or a group of words taken from another source and inserted into the writerâ€™s work, usually to make a point, prove a point or act as evidence. Reference - The process of mentioning the work of another or another person/group/company/institution. An academic reference will usually involve information on where the original work/quote may be found and checked. Referencing - The act of adding mentions of another person/company/institution and/or their work within a piece of academic text. Refutation - The act of refuting, which means denying or opposing with the intention, successfully or otherwise, of proving the original statement to be false or incorrect. Report - Information conveyed in order to explain what happened or what the current state of affairs may be. A report may be made that looks to the future, but may only report upon the past and present in order to hypothesis and make predictions about the future. Research essay - An essay featuring and describing the research work done by the writer. Response essay - An essay based around the work, statement, or claim of another to either agree, disagree, point something out, or to expand in some way. A response essay may agree, disagree, or even remain neutral. Revision - The going over of work or content to refresh ones knowledge. It may also mean making changes to pieces of work. Rhetoric - persuasive writing or speech that gets a point across or communicates in a persuasive way. Rhetorical questions - A question that is part of a personâ€™s rhetoric. It is not a question asked with the view to getting an answer. A good rhetorical question will imply the answer without anyone having to give one, or will make a point through the questioning. Rhetorical strategy or mode - The mode(s) of persuasion referred to as rhetorical appeals or strategies. They are the devices that classify the speaker's appeal to the audience in rhetoric. These are logos, ethos or pathos. Rigor - The rigidity or stiffness of something. In academic terms it may refer to the strength or an argument or paper as a whole, and/or how well it stands up to criticism. Sarcasm - Mocking or deriding language that uses the opposite of what is true or correct. It is the deliberate use of opposites in order to lie but make the lie obvious in a mocking or deriding fashion. Satire - It involves criticism or critical comments that use wit, irony, ridicule and/or sarcasm to make the point. Scholarly literature - This is written work produced by an academic institution and the people within, which includes students. Scholarship essay - An essay a student sends off to convince a group that he or she is worthy of a scholarship. Show how - Demonstrate your knowledge of something by giving instructions on the matter. Simile - It is figurative language that draws a comparison. It will usually contain the words 'like' or 'as'. Slang - Words used by people on mass to signify something that is not defined as such in a dictionary. Slang is not something that is taught within in English. Spatial order - This is where items are arranged according to their relationships or physical position. Specific - To be precise or detailed and avoiding any vagueness. Speech - Communication through speaking, or a piece of text that a person prepares so that he or she may give a speech without having to think up the content of the speech on the spot. State - The act of declaring something. To express something in words or announce something. Statement - A declaration of almost anything. It may be a declaration of intent or meaning or a declaration of a point. It cannot be a question. It may be a fact, intention or policy. Statistics project - A project that has works on statistics with a view to a conclusion, result or answer. Structure - A system of parts that are arranged in a designated order or function in a designated order. The system of parts are usually organized in a way that makes them linked in some way to form a larger whole. Style - The manner in which something is done. Within academics it may refer to the way a piece is written or referenced. Stylistics - The study of linguistic style that includes both written and spoken language. It may include literary works or genres, and may categorize specific groups. Subheading - A version of a heading that separates out a piece of work to make it easier to read and/or understand. It may separate out portions of a piece of work that are already under category headers. Subjective - Based on feels, opinion or a point of view rather than evidence and/or facts. Summary - A short description of the main points of a piece of work. A collection of points that sum up the work as a whole. A way of getting a brief view of a piece of work. Symbol - Something that represent something else. Syntax - This is the organization or framework of sentences. It is also a branch of grammar that studies and dictates the rules of correct structure, organization and framework of sentences. Term paper - This is a paper that should help the student show how much he or she has learnt over the course of the term. Professors set term papers for that very reason and to help students find out what elements they need to improve upon. Theory - Speculation, an idea formed by speculation, a question formed by speculation. Or a set of rules, guides, techniques and practices. Thesis statement - A thesis statement is something that is explained, supported, proved, disproved or developed during the course of the paper. Tone - This is the character or feel of a piece or subject. It is the atmosphere and/or ambience that the writer sets. Topic sentence - A sentence that explains what a paragraph, section or full essay is about. Trace - A small quantity or a remaining sign or signal. Transition - A process of change. In an essay it may mean the change from one sentence to another or the change between one paragraph to another. It may also mean the change between point/subject to point/subject. It requires either a definite end or an indication of what may be to come. Translate - To interpret data in a way that makes it understandable for your audience. To put it in a way that your target audience can understand. Turabian style - This is the most commonly used referencing and citation style used by researchers and academics doing research. Understatement - This is a muted or restrained statement of expression. It is a statement that is deliberately understated, which means it is less forceful and/or less dramatic than it otherwise should be. Unity - A combination of two or more to become one, or the condition of being one. It may also mean a whole that is made up of numerous separate entities. It may also be used to describe harmony. Unreliable - In academics an unreliable source is one that is not academically credible. This means it cannot be used to prove a point or a fact, and cannot be used as evidence without making your essay flawed and/or unreliable in itself. Validity - It signifies the reason why something is valid within a certain situation. In terms of data or evidence, it indicates their relevance or correctness. Vancouver style - One of the most commonly used referencing and citation styles used within medical and physical science papers. The other most commonly used being Harvard. Vantage point - A specific point of view. From the writerâ€™s perspective, it is his or her point of view. When referring to others, it is their unique view of a situation or event. Writerâ€™s block - This is the name given to a period during writing when further ideas around what to write are absent. It is a frame of mind that makes a piece of writing very difficult to continue.